When asked “In this age of kali which invades by confusing the mind and faith of sentient, how can you maintain your firm faith?”, amudhanAr replies “that invasion happens only for those who are not involved in the knowledge spread by emperumAnAr“. Your highness talked about your love towards the devotees, as ‘avar emmai ninRu ALum periyavarE’ (in the previous pAsuram), but – In this day and age of kali that invades by confusing the mind of knowledge, faith, and love, of sentient, is it possible for you to have this faith staying together strong? – few who were present nearby asked so; amudhanAr replies – since emperumAnAr is complete in his qualities of greatness, kindness, etc., if those with limited or absent knowledge attempt to praise him, he would accommodate to possess the nature, form, qualities and places as per the qualification of such people; this time and age of kali would only invade into those who do not possess the intellect spread by such emperumAnAr, and it would not affect me who got such intellect from emperumAnAr; so for me there is no problem of continuation of this faith till time eternal that this AthmA would be present. kali porum – kali would gain upper hand and oppress them. It would not do so to those who have joined, is the thought. 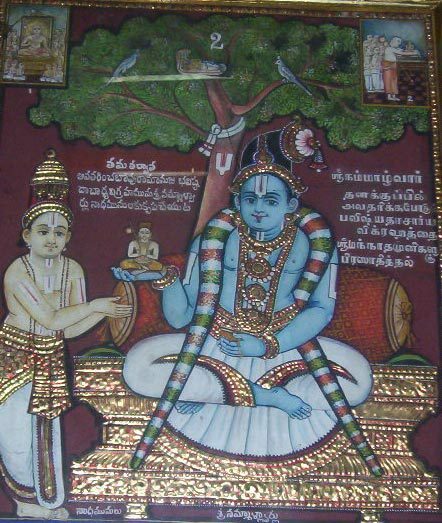 When recited as ‘guNangatku uriya sol onRum udaiyavan’ – (onRum – > how two different levels fit together due to his greatness and kindness); their words are based on their level of knowledge and ability, or lack of knowledge and ability; It cannot be said that the words of praise (of learned ones) are excessive, or (words of the illiterate) would not fit enough, and so cannot say that these are a match of unmatchable – this is due to his unbreakable greatness on the one side, and unbounded kindness on the other side (respectively); so those words would fit him – he is such a lord – is the thought here. since he is having great glory of winning all the philosophies in debate with a thousand faces, how much ever may be the knowledge and ability of others, they would not be able to praise according to his level; if so, it does not need a mention about those with lack of knowledge and ability. thoNdaradippodi AzhvAr too said this same meaning in ‘kAvalil pulanai vaiththu kali thannaik kadakkap pAyndhu – nAvalittu uzhi tharuginRom naman thamar thalaigaL meedhE [thirumAlai – 1]’ (~kali would not disturb those who are devotees of emperumAn). and ‘parihara madhusUdhana prapannAn prabhuraham anya nruNAm na vaishNavANAm’ (~do not go near the place of emperumAn’s devotees; I am not the lord for them; they are my lord) and, ‘thyaja bata dhUra tharENa thAn apApAn’ (leave those devotees; they are not of any sins), so said yaman too to his servants (prostrate before emperumAn‘s devotees and stay away from them), as said in ‘namanum than thUdhuvaraik kUvich chevikku [nAnmugan thiruvanthAdhi – 68]’ (yaman said into to the ears of his servants). enRu enRu – those of non-blemished knowledge keep thinking about emperumAnAr again and again, so this is said twice. My steadfastness that whoever keeps in his mind about emperumAnAr would be my lords (as said in earlier pAsuram), would not be affected by kali because emperumAnAr has made himself available due to his kindness and has included me in that group. This entry was posted in iyaRpA, rAmAnusa nURRanthAdhi and tagged amudhanar, emperumanar, kali, nurrandhadhi, nurranthadhi, nutrandhadhi, nutranthadhi, ramanujar, ramanusa, thiruvandhadhi, thiruvanthadhi on March 20, 2017 by raghuram.